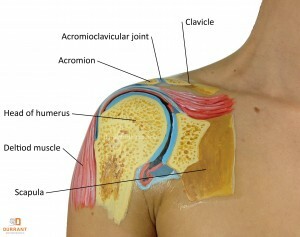 The AC (Acromioclavicular) joint is the bony ‘bump’ you can feel at the top of your shoulder. This AC joint is where the collar bone (clavicle) and the top of the shoulder blade (scapula) meet. This AC joint forms part of the “socket” of the shoulder for which the arm bone (humerus) fits into. An injury to the AC joint is sometimes referred to as a “shoulder separation”. An AC joint injury can sometimes be confused with a shoulder dislocation. These are two very different injuries. A shoulder dislocation is where the humerus becomes displaced out of its socket. An AC joint injury is where there is disruption to the AC joint where the clavicle and scapula join. The symptoms, treatment, and potential complications of these two separate injuries are very different. An AC joint injury is usually caused by a sudden traumatic event such as falling from a height onto an outstretched arm, or from direct hard contact onto the shoulder, such as in a rugby tackle. Another common cause is being thrown over the handlebars of a bike. It is important to note that an AC injury does not have to involve any bones being broken. It is the joint, either the ligaments holding the joint in place, or the clavicle bone, that is separated or displaced. AC joint injuries are graded in severity from I to VI. With a minor AC joint injury, some of the ligaments that stabilize the shoulder joint may be partially torn. In a severe AC joint injury the clavicle may have been pushed into the shoulder muscle and caused puncture or tearing of the muscle or the clavicle may be displaced down into the scapula. In severe AC joint injuries there will be a prominent visual bump over the top of the shoulder accompanied by intense pain. Treatment for an AC joint injury will initially involve rest and support of the shoulder joint, application of a cold compress, and often anti-inflammatory medication to reduce swelling and pain. For less severe injuries, grades I, II, this initial treatment as well as physical therapy is usually sufficient enough for the person to fully recover within four weeks to four months. For grade III injuries surgery may be required if recovery is too slow. Mr. Durrant may choose to see if the shoulder will recover with non-surgical treatment before operating on the injured shoulder. For more severe, grade IV, V, and VI, injuries surgery is almost always required. 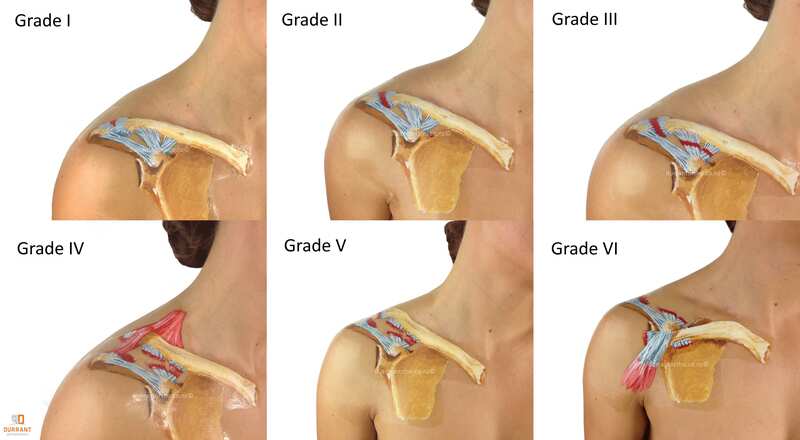 Surgical treatment of AC joint injuries aims to stabilize the clavicle into the correct position. Sometimes arthroscopic surgery is sufficient, where the end of the clavicle is removed or resected. In moderate injuries this procedure is sometimes enough to ease the pain and discomfort in the shoulder, and regain full mobility of the joint. However for more severe injuries, a combination of arthroscopic and open surgery is likely to be required. Mr. Durrant uses a procedure to reconstruct the ligaments that secure the AC joint. A hamstring tendon or an artificial graft is used to reconstruct the ligaments as the damaged ligaments are usually not repairable. This then provides greater stability for the AC joint and aims to eliminate pain. Your recovery from AC Joint surgery depends on the severity of the injury. Generally patients will experience a greater range of movement of the shoulder and less pain within about three weeks. The recovery process will continue for the next three months, where significant mobility and very little pain should be experience. Within the next six to nine months after surgery, the shoulder should fully recover, regaining its full strength. Mr. Durrant has extensive experience in dealing with mild and severe AC joint injuries. He is very well versed with the advancements made in shoulder surgery over the past decade and performs much of his shoulder surgery via arthroscopic, or keyhole, surgical procedure. Arthroscopic surgery is a less invasive procedure which offers a faster recovery time and less visual scarring compared to traditional open surgery. Whether your AC joint injury is mild or severe, Mr. Durrant is able to correctly diagnose and provide effective treatment for your AC joint injury. Please contact Mr. Adam Durrants office for more information on AC joint pain and shoulder instability or for additional resources on other shoulder related injuries.